The RYOBI 18V Workshop Blower delivers a fast job site cleanup with 93 CFM and 160 MPH and a variable speed trigger that includes 3 speed modes for more control of air flow. This blower has a compact and lightweight design for convenient portability and ease of use. Also loaded with an integrated rubber nozzle, this workshop blower helps protect work surface of the job site. Backed by 3-years limited warranty, RYOBI 18V Workshop Blower works with any 18V ONE+ battery (sold separately) and is a part of the ONE+ System of over 70 great tools that all work with the same 18V battery platform. The EGO POWER+530 CFM Blower is the next, big step up in power and convenience for cordless blowers. Turbine fan engineering, inspired by advanced aeronautics technology, performs better than many premium gas-powered models. The light-weight, compact, high-efficiency brushless motor delivers longer run time, low vibrations and an extended motor life. Compatible with all EGO 56-Volt Arc Lithium batteries to deliver Power Beyond Belief. The EGO POWER+ 580 CFM Blower is the most powerful cordless blower in the industry! Turbine fan engineering, inspired by advanced aeronautics technology, performs better than premium gas-powered models. The high-efficiency brushless motor delivers longer run time, low vibrations and an extended motor life. The included spread nozzle attachment make clearing debris even easier. This quiet, light-weight and compact blower gets the job done easier and faster! 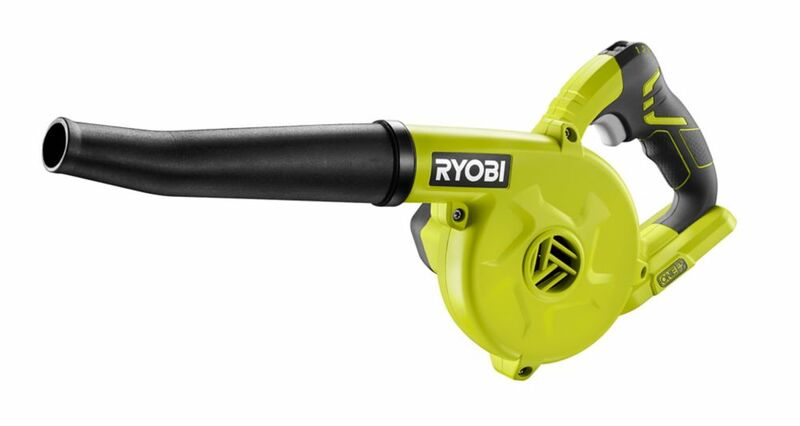 18V ONE+ Cordless Compact Blower (Tool Only) The RYOBI 18V Workshop Blower delivers a fast job site cleanup with 93 CFM and 160 MPH and a variable speed trigger that includes 3 speed modes for more control of air flow. This blower has a compact and lightweight design for convenient portability and ease of use. Also loaded with an integrated rubber nozzle, this workshop blower helps protect work surface of the job site. Backed by 3-years limited warranty, RYOBI 18V Workshop Blower works with any 18V ONE+ battery (sold separately) and is a part of the ONE+ System of over 70 great tools that all work with the same 18V battery platform. 18V ONE+ Cordless Compact Blower (Tool Only) is rated 4.6 out of 5 by 297. Rated 5 out of 5 by backizback from This is the second one we purchased, the first was for a gift to be used for a wood worker to cle... This is the second one we purchased, the first was for a gift to be used for a wood worker to clean the shop area. The recent purchase was to be used for quick removal of leaves and debris from our deck and porch. This works faster than a broom and stores away with ease. the only issue would be the nozzle could be a little longer. Rated 5 out of 5 by Pilotman from The power of a corded blower with cordless versatility to... The power of a corded blower with cordless versatility to keep my work and work area dust free.GREAT PRODUCT!!! Rated 5 out of 5 by Espo from Blower works as a blower should. Powerful. Doubles as a... Blower works as a blower should. Powerful. Doubles as a great leaf blower for my 6 year old to go out and help in the yard. Rated 3 out of 5 by Jackie from It cooks thru a 3A battery pretty fast but, It... It cooks thru a 3A battery pretty fast but, It makes up for it with powerful blast of air in a small hand held blower.